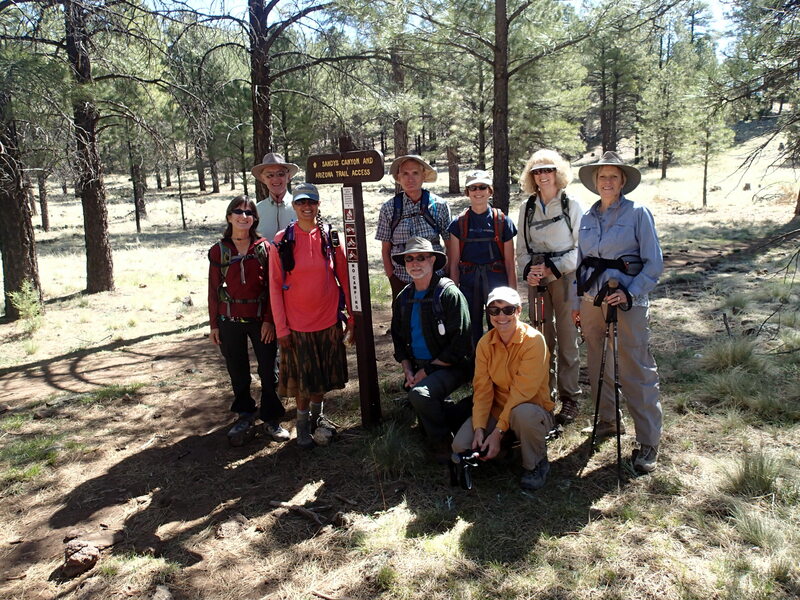 After a wonderful time on the Women’s Backpacking trip, the next day I led a group of folks on a hike from Sandy’s Canyon into Flagstaff. 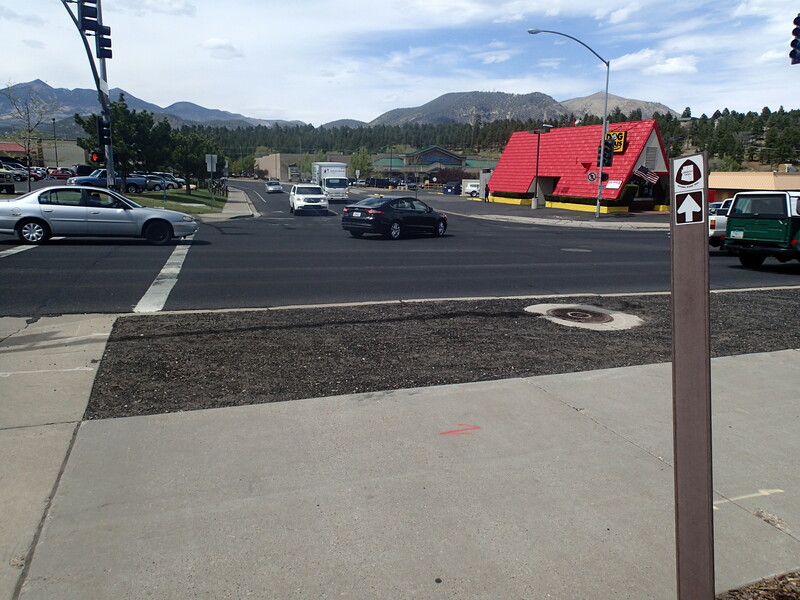 It was so exciting for me to reach Flagstaff on foot- it’s like my second home! The river company I work for in the summertime, Arizona River Runners, is based out of Flag and I spend quite a bit of time there. 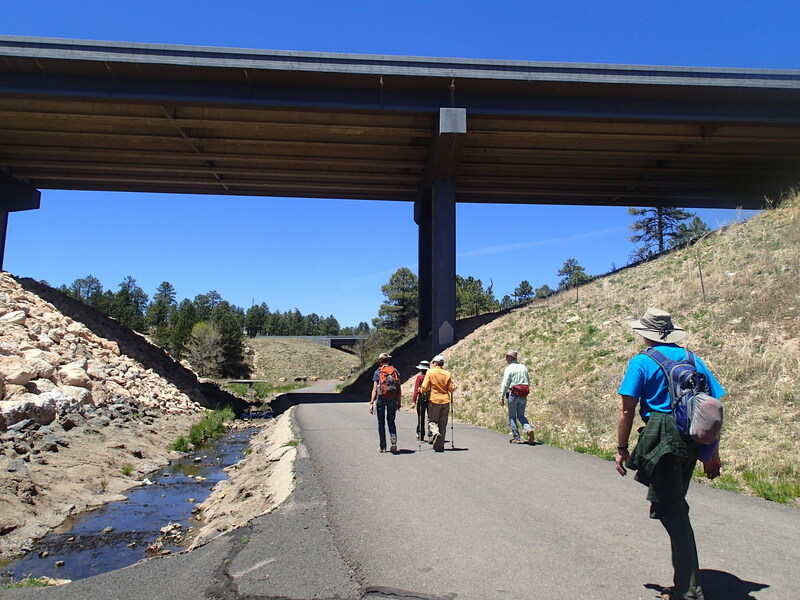 We had a great time on the hike into town and reached Flagstaff around noon. 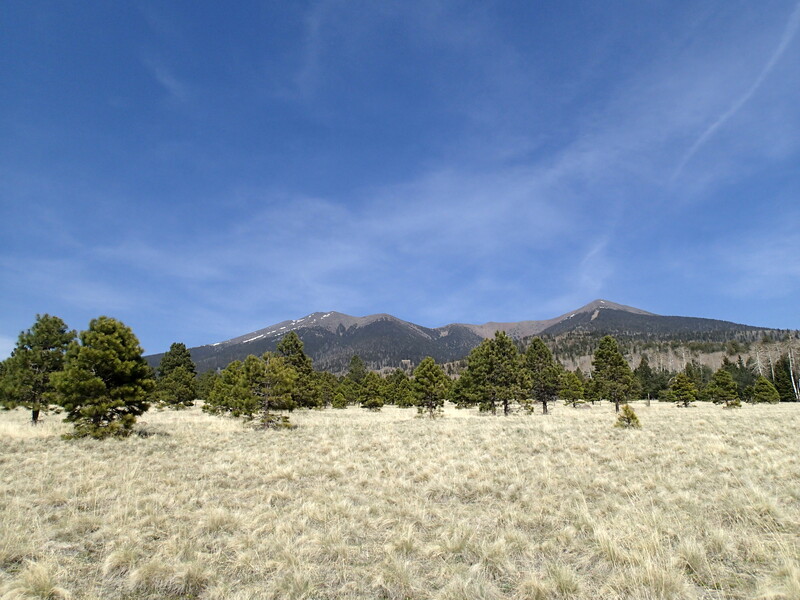 My dad met me and after lunch, took me up to Schultz Pass so that I could hike the remainder of the passage and connect my steps back into Flagstaff. 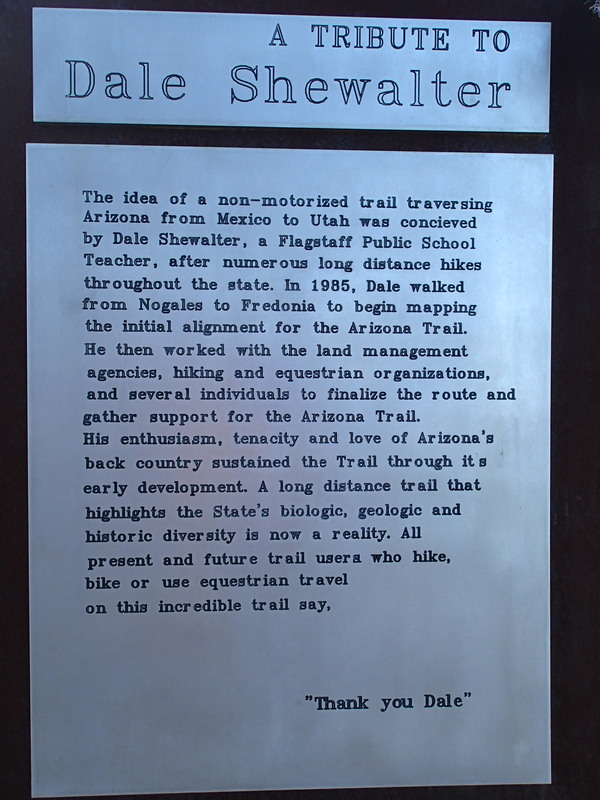 I took a solemn break at the Dale Shewalter memorial and thanked him for his vision of this fantastic trail that connects the state. My friend and co-worker on the river Chelsea was waiting for me at Buffalo Park in the evening and we met some other river folk for dinner. The next day, my husband Brian drove up to Flagstaff to see me and I got to relax a bit before the Gateway Community Event at Wanderlust Brewing Company. What a wonderful event! The place was packed, the weather was perfect for the patio, and the Diamond Down String Band provided tunes for people to dance to. I was honored that members of the Shewalter family attended the event. It just so happened that the event fell on Dale Shewalter’s birthday, totally unplanned but a fantastic coincidence. Unfortunately, about 20 minutes before the end of the event, I started to feel sick. Even had to go throw up a couple times before the night was over (and I don’t even drink!). It ended up being a total pukefest back at the hotel that lasted all night long. The next morning, Brian did all he could to help me out. 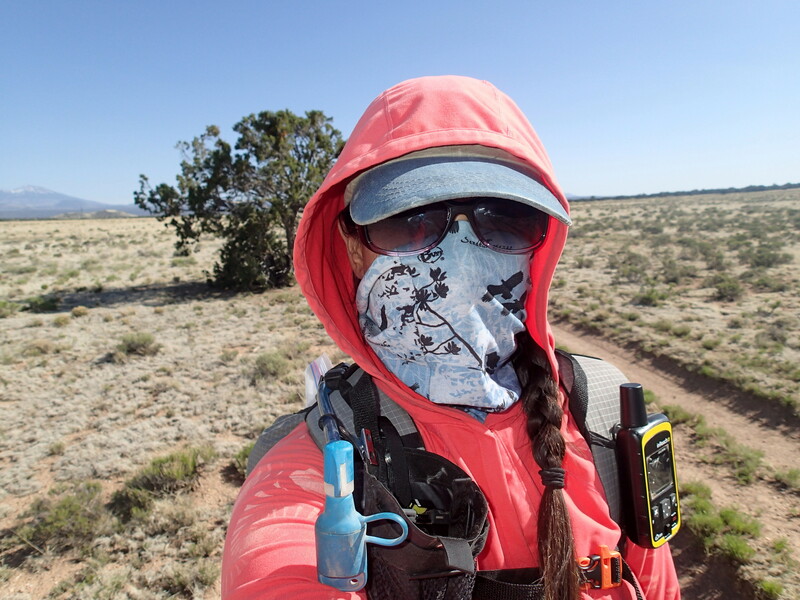 I wasn’t sure if I was going to be able to hike the 10 miles I had scheduled- I was so weak and still felt sick. Thankfully by the afternoon, I was feeling somewhat human and had Brian drop me off at Snowbowl to hike down to Schultz Pass. I got it done, but hiking is no fun at all when you’re tired and have to stop to throw up. In the evening, Brian helped me pack for the next passages. I was so glad that he was there to take care of me and that I hadn’t gotten sick when solo deep in the wilderness. In the morning, I felt a million times better and one of the ladies from the Women’s trip, Anne McGuffey, came to pick me up to take me to Snowbowl to continue north. She’s planning on a future thru-hike and was excited to see parts of the trail she hadn’t seen before while running support for me. She dropped me off around 10:30 and we planned on meeting at Kelly Tank in the afternoon. This is one of the parts of the trail that wasn’t complete when I hiked it in 2008 and the end result is gorgeous!! 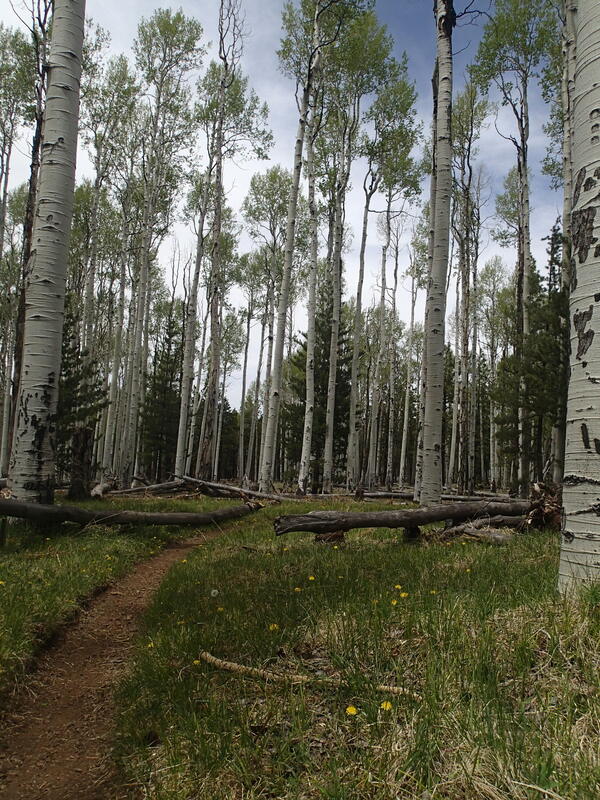 Winding trail through aspen glades, views of the Peaks and fancy signs telling me I have less than 200 miles until Utah. 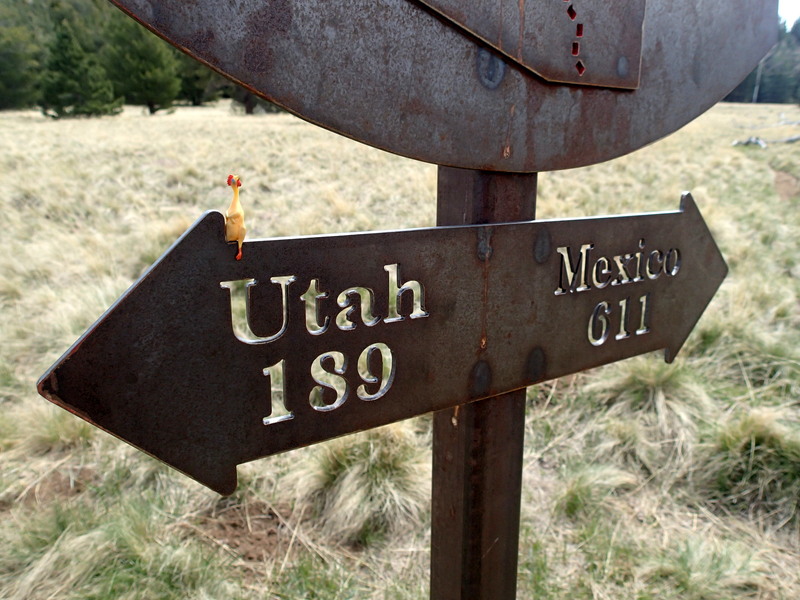 Micro Chicken is getting ever closer to Utah! I reached FR 418 and realized that I’d lost my hiking poles! Shoot. Back up the trail I went and thankfully they were less than 15 minutes away. 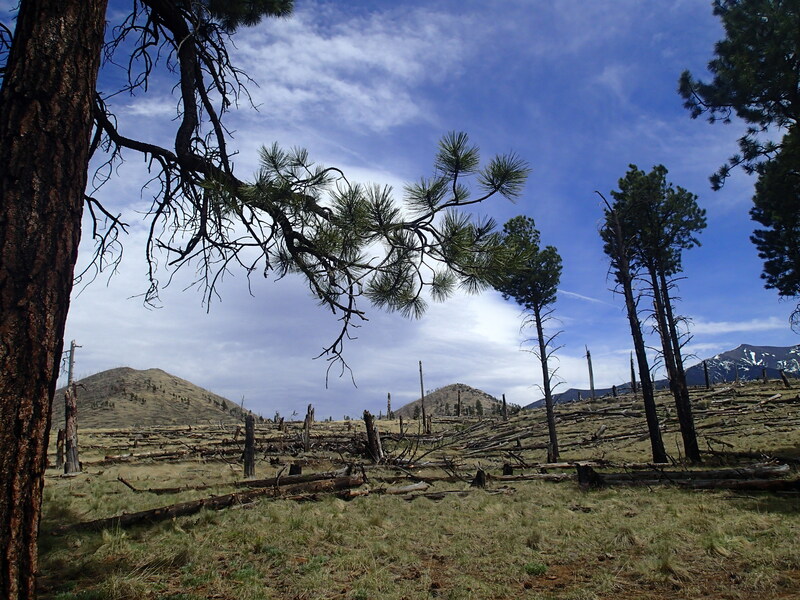 The Peaks got farther away and I entered the White Horse Hills, covered in downed burned trees but still attractive. Anne was waiting for me at dry Kelly Tank and we took a lunch break with the sound of mooing cows. We planned on meeting for camp off of FR 416 near Missouri Bill Hill. 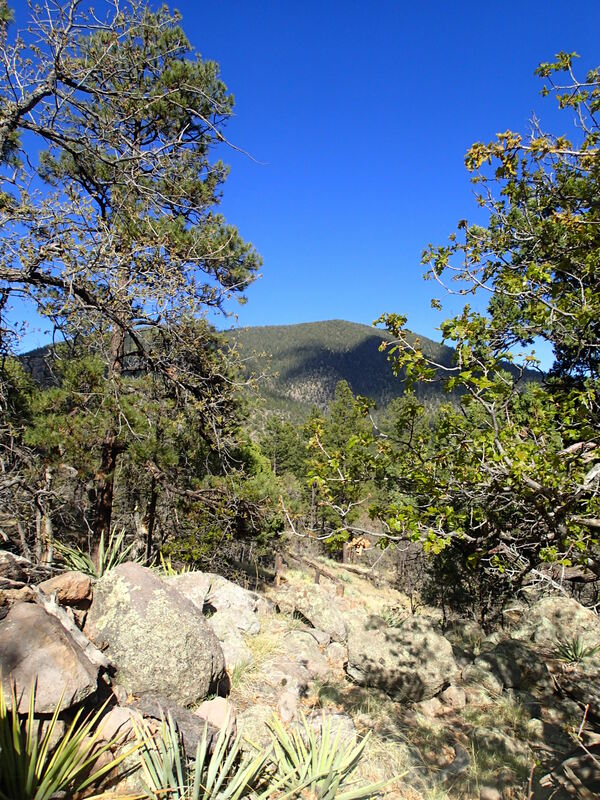 The remainder of the day was spent hiking on FR 416, a rocky two-track road. I reached a gate on the west side of Missouri Bill Hill and could see the next passage through the Babbitt Ranch to the north. I got to the base of the hill and started to look for Anne’s car. No Anne. My feet were pretty tired by this time, I’d already gone 21 miles. I tried to call, but there was no cell reception. Only thing to do is keep hiking. 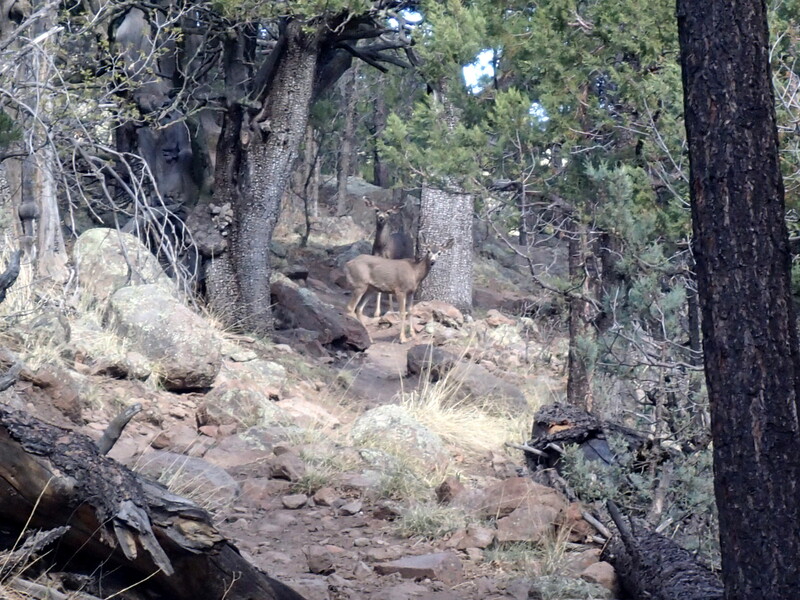 I figured she was just down the road, but it was a tense couple of miles until I found her camp right before dark. My longest day yet- 23 miles since 10:30. 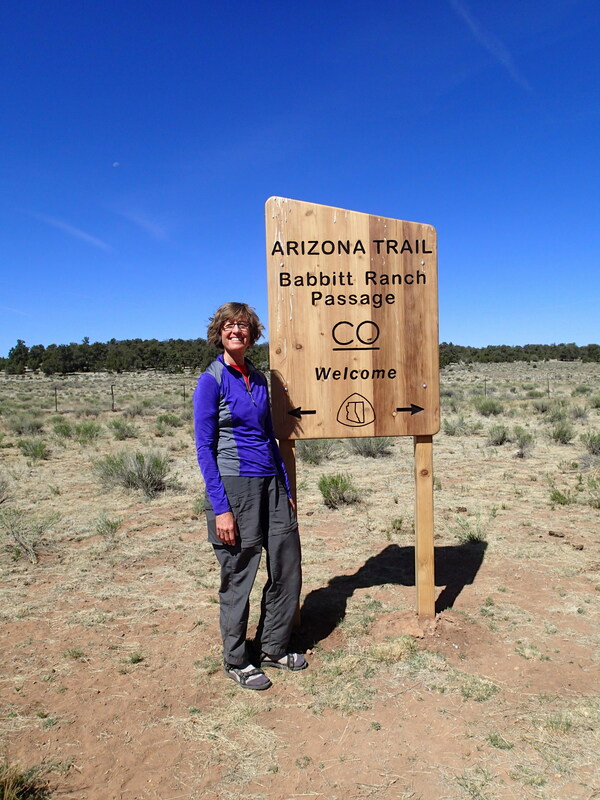 The next day was spent traversing the Babbitt Ranch- a landscape like no other on the AZT. The “trail” is actually on a series of ranch roads. It is generally a windy area, but on this day there was a red flag warning on top of it- gale force winds all day long. 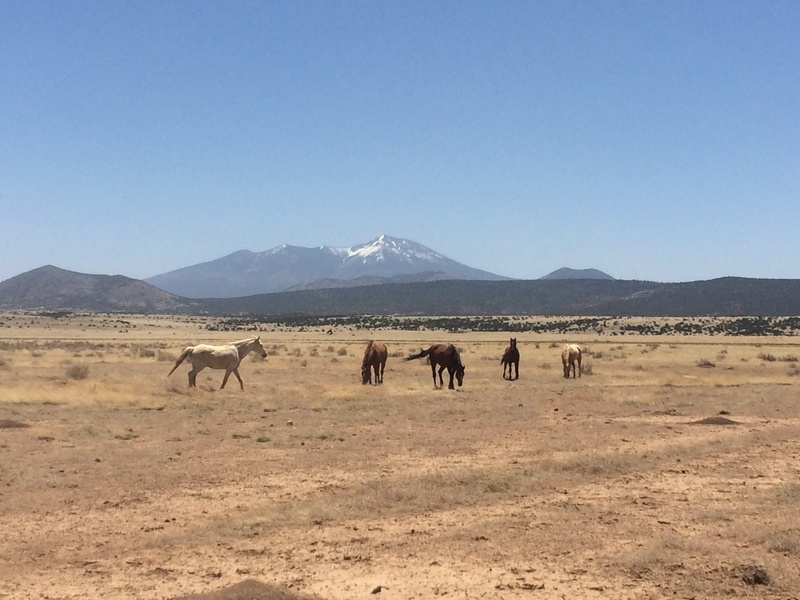 I reached Tub Ranch and saw an antelope dash off and a group of horses milling about. Strangely, I saw no cows the entire day. 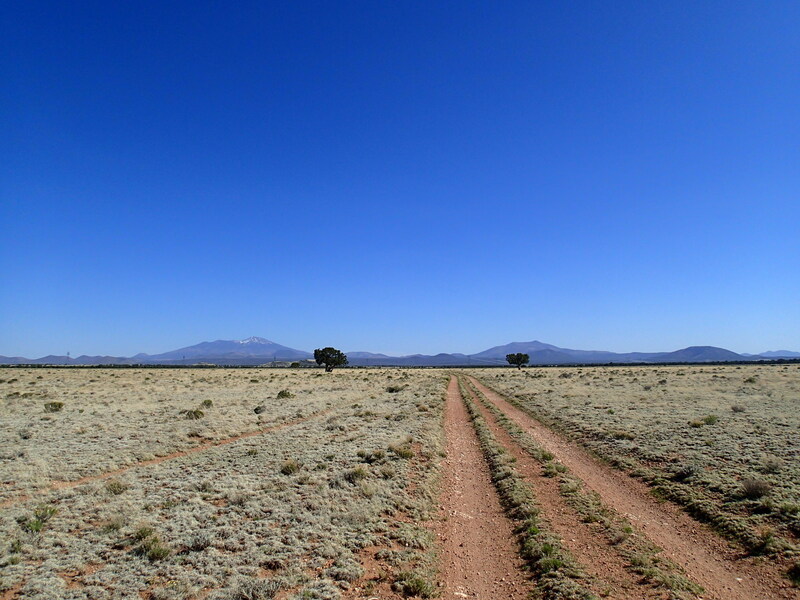 The Peaks receded into the distance and I hiked the dusty, windy road. Anne ended up leapfrogging with me the rest of the day, since she could drive the trail. It was great to have her support and I ended up hiking through the whole ranch in one 22-mile day. It was also helpful to have her around because so many of the water sources I’d normally have relied on were dry. 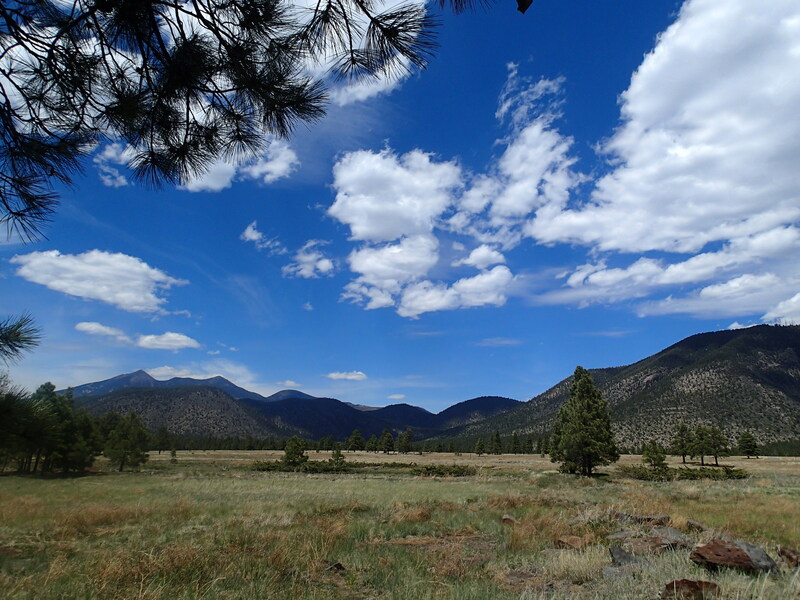 We camped at the Kaibab Forest Boundary. 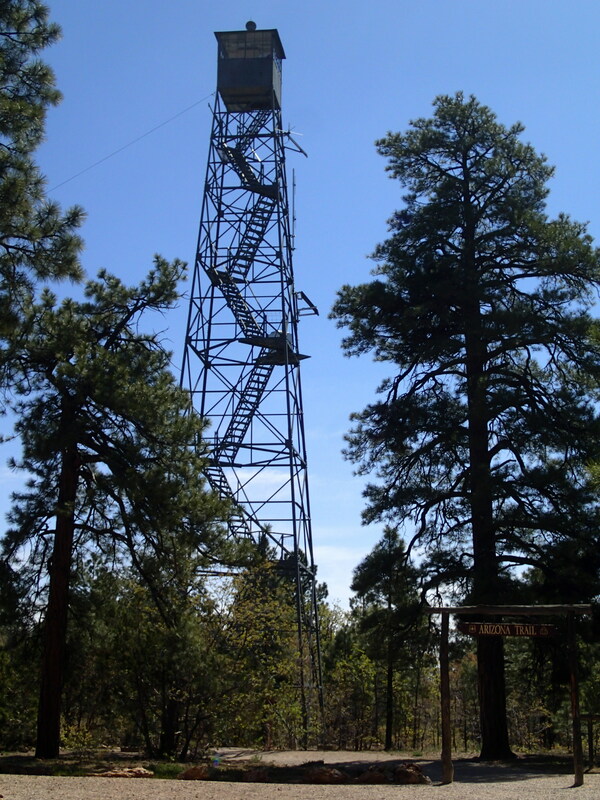 The next day Anne left and I backpacked the rest of the way to the Grandview Lookout Tower south of the Grand Canyon. My feet were pretty sore from the previous two days and I was happy to be back on singletrack again. Not a fan of roadwalking. 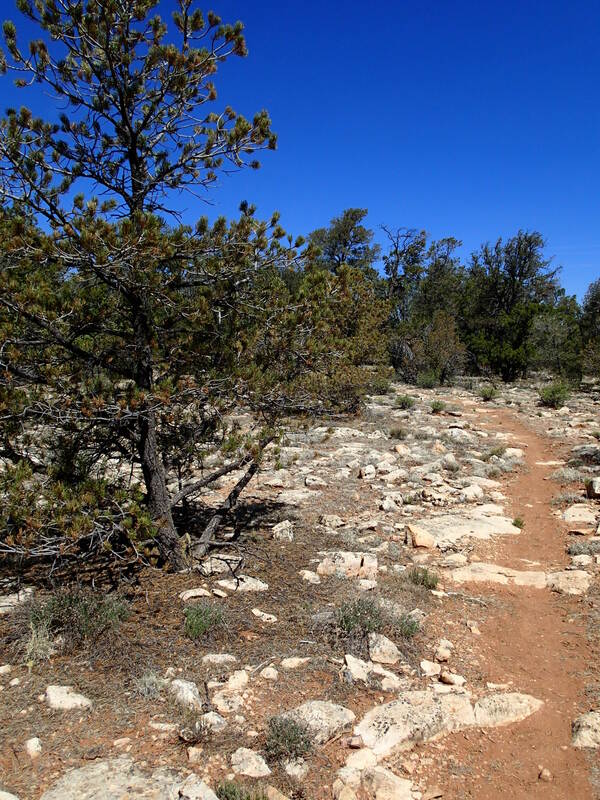 The trail pleasantly wound through the pinyon and juniper, I skipped the side-trip to Moqui Stage Station as I’d seen the ruins in 2009. I reached Russell Tank, also dry this year. Thankfully a generous trail steward had cached me some water nearby. 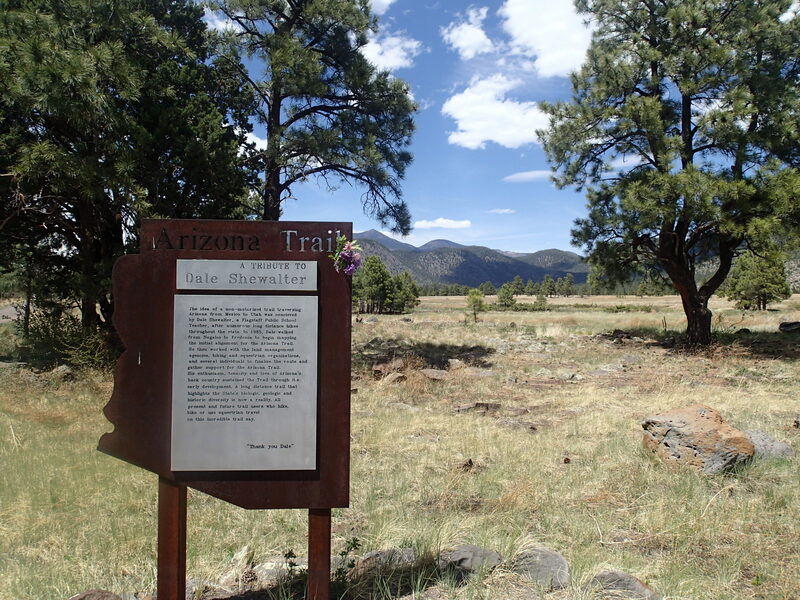 After Russell Tank, the trail reached the Coconino Rim and began heading west. I got my first glimpse of the Grand Canyon and it literally stopped me in my tracks. 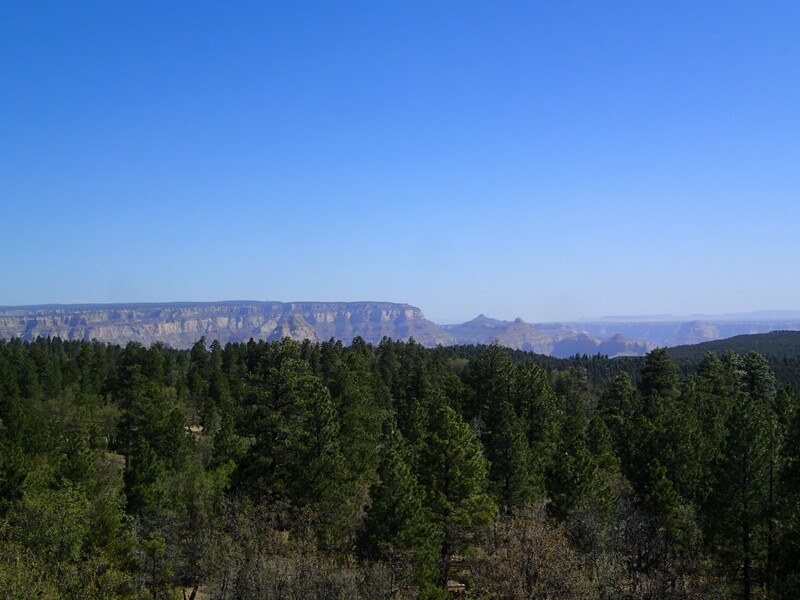 I could see the white Coconino cliffbands and the forested North Rim. Giddy with excitement, I had a little on-trail celebration at seeing my favorite place. Soon enough I’d be hiking through. 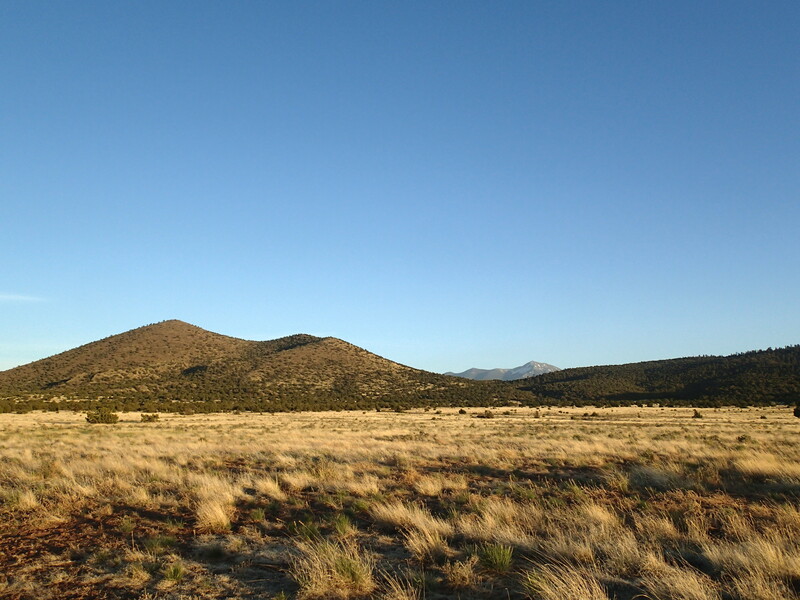 I found a spot to camp and then the next morning hiked the rest of the way to Grandview. I climbed the lookout tower (scary but great views!) and then my friend Tom came and got me. Later, I met Levi, the videographer, at the Grand Canyon so that we could shoot some footage. Good thing we didn’t wait for the following day- smoke from the Slide Fire in Sedona had completely obliterated the view. 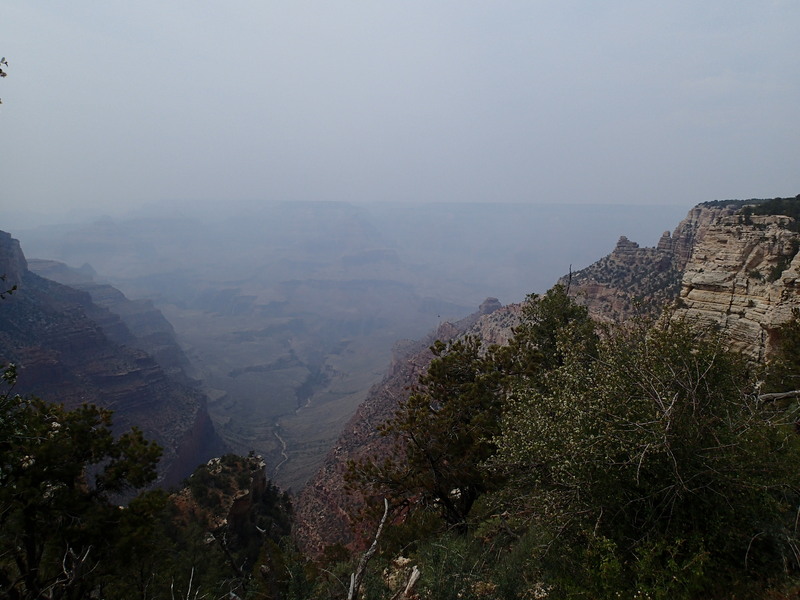 Next up: Rim to Rim in the Grand Canyon! Arizona Trail Trek – Still out here hiking! I apologize for not updating the blog recently. 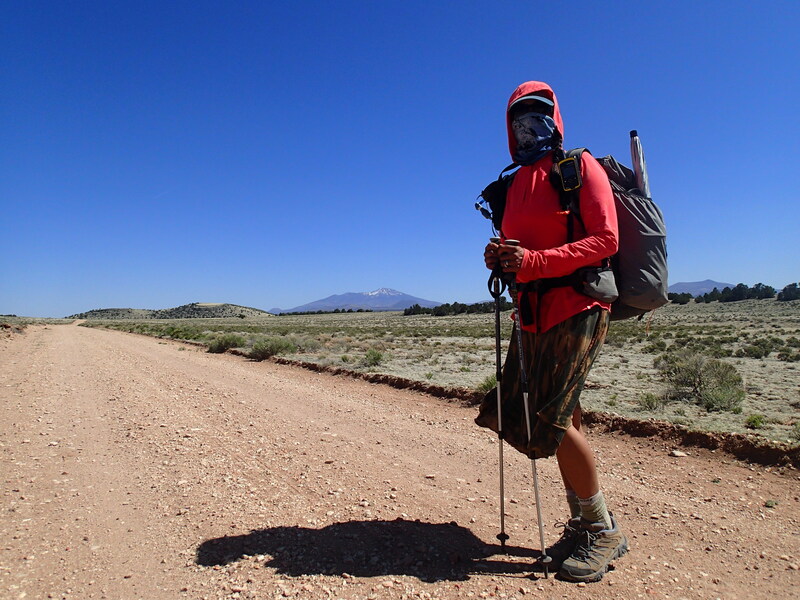 It’s tough to thru-hike, hold events, lead hikes, and be timely about the blog at the same time. I’ve had some incredible experiences out here and promise a more detailed account once I reach the Grand Canyon! 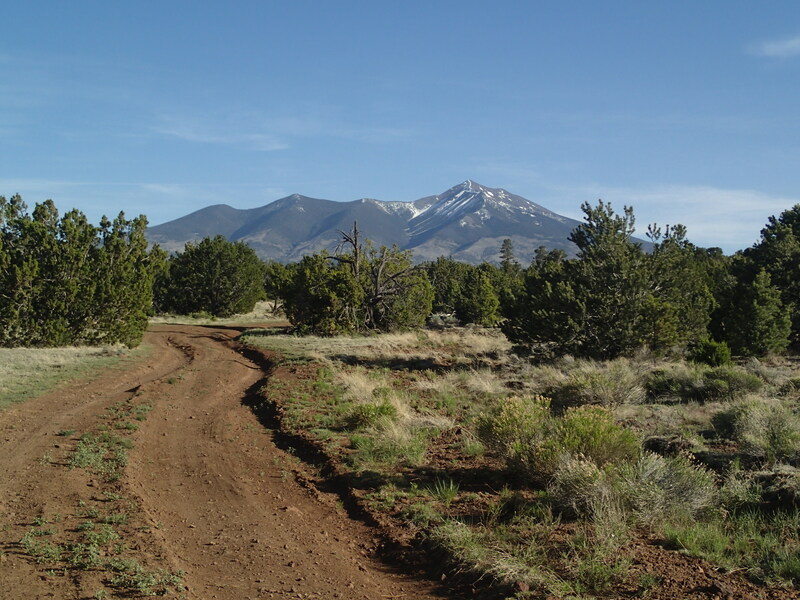 There’s less than 10 days left in the campaign to raise $20,000 for the Arizona Trail Association- please share the link with others so we can reach our goal! All sorts of perks available when you donate, like an Arizona Trail Pint Glass, signed artwork by Cole Habay, and the opportunity to participate in a special Arizona Highways Photo Workshop! 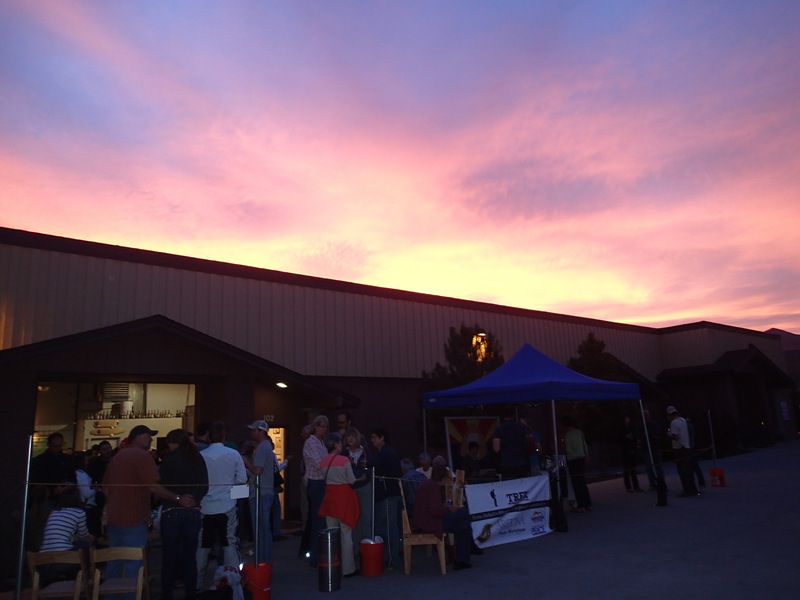 There’s even a chance for you and a friend to help brew Arizona Trail Ale and stay in a cabin and eat at That Brewery in charming Pine, AZ. Another update coming soon, I promise!